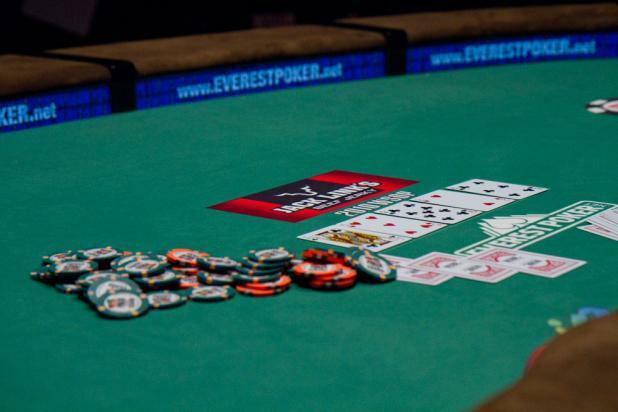 The river card is the 6c, potentially completing a flush, and Dwan asks for a count of Randall's remaining stack. Dwan thinks for a couple of minutes longer before he says, "All in." Tom "Durrrr" Dwan (left) and David "Ghettofabulous" Randall face off in a hand that takes well over ten minutes. It is a battle of the blinds in Hand #109 as they limp to see a flop of Jc-9c-5h. Dwan bets and Randall quickly calls. The turn card is the 2h, and this is where time seems to slow down. Dwan thinks before he puts out a big bet, and Randall goes into the tank for a couple of minutes before he calls. With three players left, David "Ghettofabulous" Randall was in control with the chip lead. But in Hand #90, he raises from the button with 10-6 offsuit. Simon Watt takes his time before reraising, and then Randall moves all in. Watt calls Randall's bluff with pocket sevens (7-7), and would win the hand to double up into the chip lead. Tom "Durrrr" Dwan wasn't involved in the hand, but it definitely shifted control of the table from Randall to Watt. 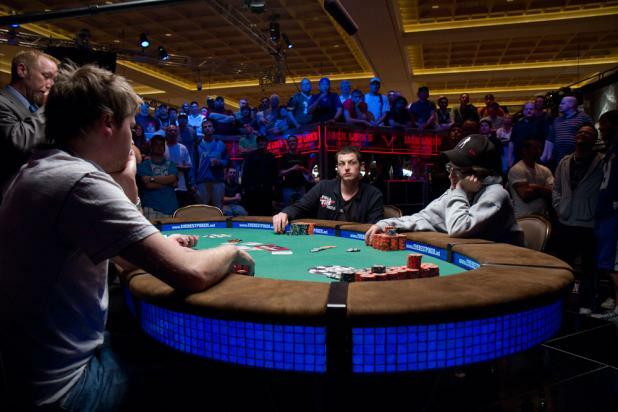 Never before have so many high-stakes prop bets rumored to have been placed on whether or not the 23-year-old would win his first WSOP bracelet. 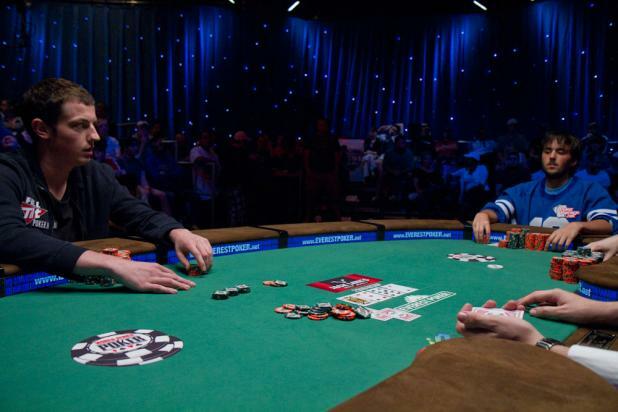 Even though the Series was just entering its second week, it felt like this could be the defining moment of the 2010 WSOP, and ESPN had a two-man crew on hand, just in case. Here, they're taping Tom "Durrrr" Dwan in a hand against David "Ghettofabulous" Randall. Tom "Durrrr" Dwan (center) watches as Austin McCormick (right) is all in and dominated with J-10 against David "Ghettofabulous" Randall's A-10. Randall is standing with his friends on the rail, watching for the turn and river on the overhead monitors. McCormick never improved and was eliminated in fourth place, earning $194,939. The pot gives Randall a big chip lead with three players left, while Dwan is the short stack. 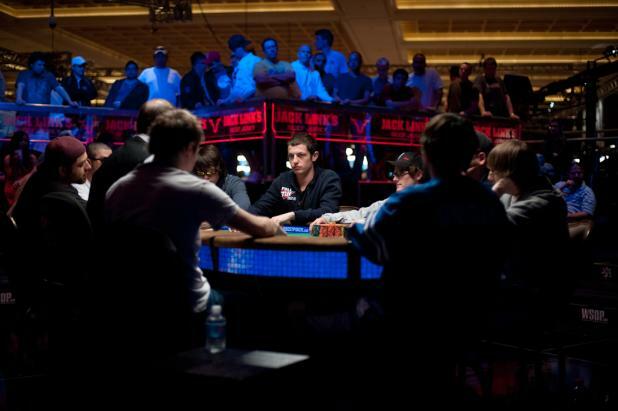 Early on, Tom "Durrrr" Dwan (seated, right) is in control of the final table, with a solid chip lead. Michael Smith (standing, left) and Marvin Rettenmaier (standing, right) face off in an all-in situation that doesn't seem to concern Dwan too much. Rettenmaier would eventually bust in seventh place, and Smith would finish sixth. 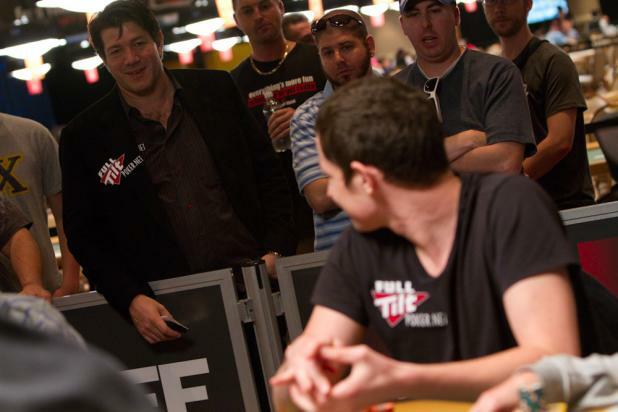 While there are nine players at the final table of Event #11 ($1,500 No-Limit Hold'em), including several who deserve notable recognition, it is obvious from the start that most of the people watching this tournament or following it online have their attention focused exclusively on Tom "Durrrr" Dwan. Dwan started the final table with a sizable chip lead (20% more chips than anyone else), and he seemed unbeatable the past two days. Would he hold on to win his first bracelet and supposedly also win millions of dollars in prop bets? 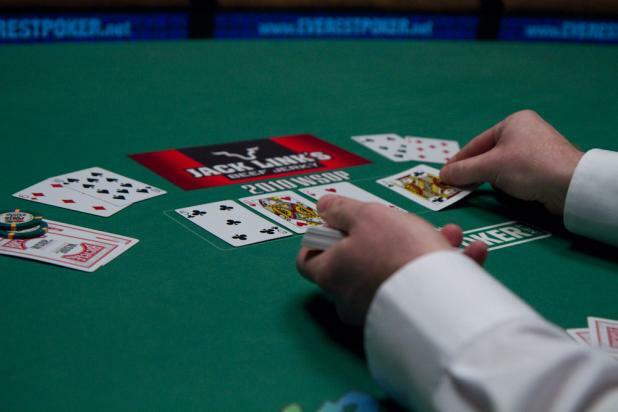 With the huge fields attracted to the low buy-ins of the $1,000 and $1,500 events, there is usually only one or two notable professional players among the final nine. But the final table of Event #11 ($1,500 No-Limit Hold'em) includes Jason Young, who won a bracelet two years ago, online pros Eric "AvrilSharapova" Ladny and David "Ghettofabulous" Randall," and Simon Watt, who won an Asia Pacific Poker Tour (APPT) event in New Zealand eight months ago. 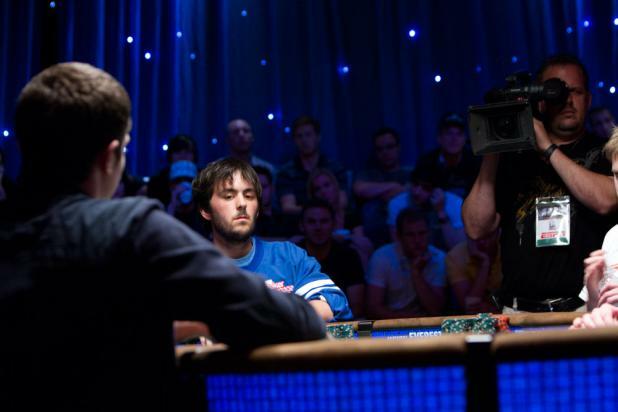 And, of course, Tom "Durrrr" Dwan, who is already reaching legendary status at the age of 23. 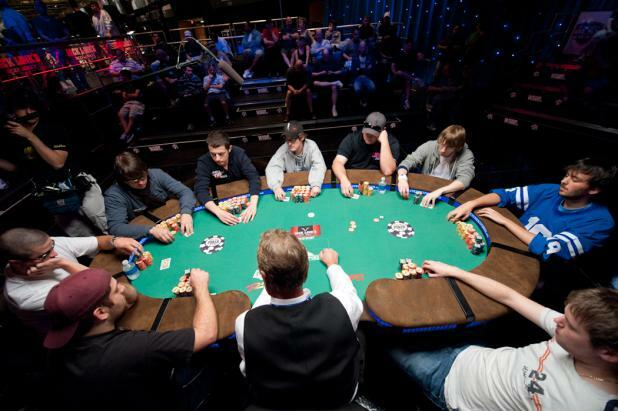 In seat order, clockwise from the dealer's left: (1) Jason Young, (2) Michael Smith, (3) Marvin Rettenmaier, (4) Tom Dwan, (5) Austin McCormick, (6) Kyle Winter, (7) Eric Ladny, (8) David Randall, and (9) Simon Watt. 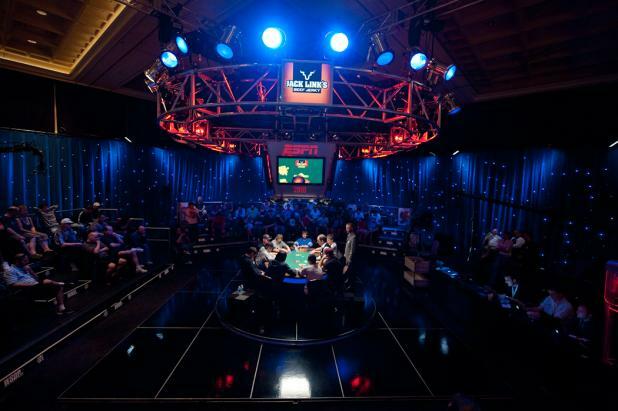 When Event #11 ($1,500 No-Limit Hold'em) reaches the final nine players, the action moves to the ESPN stage in the corner of the Amazon Room. The crowd is relatively sparse at first, and gets larger and larger as Tom "Durrrr" Dwan survives longer and longer. As Tom "Durrrr" Dwan goes deeper and deeper in Event #11 ($1,500 No-Limit Hold'em), some of the top pros (including David Benyamine, standing left) from the high-stakes cash games stop by to sweat his progress. Why are they so interested? 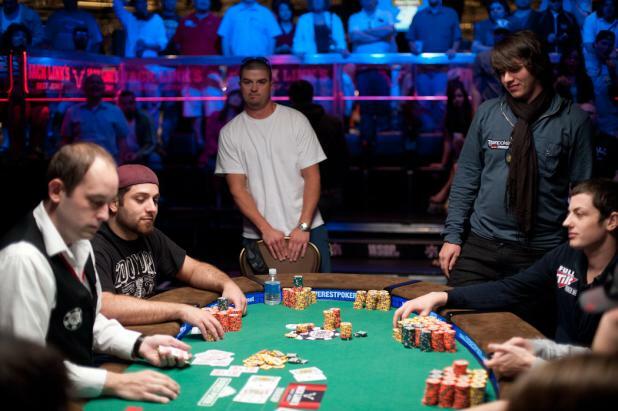 Most of them reportedly made large six- or seven-figure bets with Durrrr that he would not win a bracelet this year. First prize in this event is $614,248, but it would be many times that amount to Dwan if he wins.